Les Hirondelles (Sleeps 6 3 bedrooms 3 bath/shower rooms . Large fitted kitchen area, dishwasher, microwave, fridge/freezer, oven, hob, washing machine and clothes dryer. Also well equipped with crockery and cooking utensils for the people who love cooking whilst on holiday. The lounge has a three seater settee and a two seater settee, CD, radio, DVD, TV and satellite. Dining area with large table and seating for 8. Bathroom 2 with WC and shower enclosure. Bathroom 3 with WC and shower enclosure. Bedroom 1 and 2 with 2 double beds. Bedrooms 3 and 4 each with two single beds (overlook the gardens). The properties, with heated 12m x 6m swimming pool, are situated in a pretty and tranquil hamlet, set amidst vineyards and fields of sunflowers. Our prestige cottages are just 15 mins away from the golden sandy beaches of Meschers and St George de Didonne, with many seaside activities. We are 2km from Mortagne sur Gironde which has a supermarket, pharmacy, 2 Boulangeries, and a boucherie. It's beautiful port has several restaurants overlooking the colourful marina. Originally an old French farmhouse, our cottages have been carefully and tastefully converted to an excellent standard. All our cottages have been comfortably furnished and equipped to ensure that our visitors have a memorable stay. Les Rimaudieres is the perfect place to enjoy alfresco dining, whilst viewing wonderful sunsets and beautiful starry evenings. Each cottage has its own private patio with gas BBQ and garden furniture overlooking the established gardens and pool area, with sun loungers. Every year we grow tomatoes, strawberries, peppers, chillies, herbs,and a variety of salads so the guests can help themselves to these organic products. We have a well defined safe area for activities such as: boules, football, table tennis and badminton. We have a number of bikes which can be used to cycle the lanes and perhaps go to the local bakery for fresh bread and croissants. There are many vineyards within the immediate vicinity which offer regular tastings of wine, cognac and the local speciality product pineau charente. This is a blend of grape juice and cognac which is served chilled as an aperitif. Cognac is an hour away, where the famous Cognac houses can be visited. Royan which is 15 km away is the largest seaside town with many shops, restaurants, and activities for all the family to enjoy. There are many interesting and diverse towns and villages within the region for you to explore. This area is famous for its oysters which are said to be the finest in the world. The region has an extensive coastline, France's finest shellfish beds which produces the best seafood and locally caught fish. A speciality fish of the estuary is the prized Maigre. We have always loved France and in May 1995 went for a long weekend. Due to the continuous rain we decided to venture to the coast, where we found sunshine at Royan and thought we would view some properties in the nearby area. We then found Les Rimaudieres in a pretty hamlet amongst sunflowers and vines, but only 10mins to the beaches. We purchased the Farmhouse and Barn in 1995. It was a complete ruin and Bryan and his work team were all fired up to renovate them into 3 spacious cottages. We opened for business in May 2001 and we are still enjoying managing the rentals during the summer. Bryan is now very experienced at pool maintenance, and I and my french cleaner Annie make sure everything is clean in the cottages. We bought the property in this area because we had read that the Charente Maritime had the best sun record equal to the South of France. Also it was near some of the famous vineyards on the Medoc and St Emilion. We bought because in a lovely tranquil spot but not miles from anywhere. The scenery is so diverse, we have the marshes for the birds, beach scenery, and yet we are in the country. If you want you can visit Royan, Saintes or Bordeaux for the shops, churches and Roman remains. We enjoy every Summer and we are never tired of the area with its complete calmness. We love walking, biking and our son enjoys the surfing, canoeing. In the last 2 years we have grown vegetables, strawberries and herbs so that the guests can enjoy. The Marina at Mortagne has 4 good restaurants where we particularly enjoy the fresh oysters, moules and fish caught in the estuary The local markets are a real pleasure, with their fresh local produce grown or made in the area. Eg. Goats cheese, Foie Gras. We have bikes at the property which the guests are welcome to use. They may want to get the bread and croissants for breakfast or to explore the country lanes . Boat Trips from Mortagne sur Gironde, Meschers and Royan. For fishing enthusiasts trips available from the above locations. 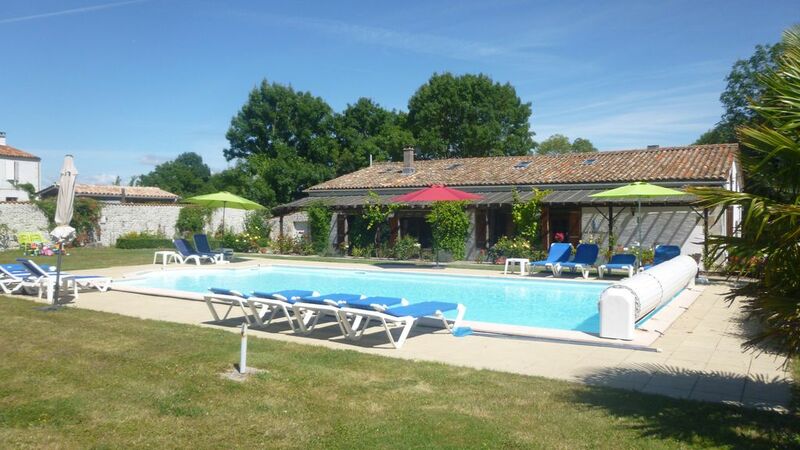 large terrace overlooking pool and gardens with wooden garden furniture..
For the golf enthusiast there are excellent courses in Royan, Saints and Cognac. Fantastic Cottage in lovely setting. La Pie Qui Chante is a lovely cottage in a beautiful setting. It's very homely and clean. It suited my husband and I and our two young girls very well. Unfortunately the weather was not brilliant the week we were there so we did not get to use the pool as much as we would have liked. On the days we did our girls had so much fun. The surrounding gardens are beautiful, plenty to keep the young ones happy - bikes, trikes, chute & swing. Table Tennis, boules, football goals. The patio area is right outside the kitchen door and you have full view of the pool and gardens so can keep an eye on the children. We visited various places - Royan, Rochefort, La Rochelle, Jonzac, Meschers Beach. The Aquarium at La Rochelle is a must - great if you have children. Moira & Brian are very welcoming and great hosts; we enjoyed having a chats with them throughout our stay. We would definitely come back again as have been told how 'nice' it is when the sun is shining and know this to be true as it was on our first day! Lovely property with enviable views onto sunflower fields. You can easily sit in the patio and watch the kids in the pool. We loved playing boules and table tennis in the evening and picking the amazing tomatoes growing in the garden. We found the location was perfect ; in the countryside but close to the coast and larger towns. The property is clean and was perfect for our needs. I would come back again. What a fantastic place. Surrounded by vinyards and sunflowers and felt very rural although the nearest village is just a 10 min cycle for fab fresh bread. Great facilities for our four year old (we couldn't get her out of the pool). The owners Moira and Brian couldn't have been more accommodating and had great recommendations for places to visit and local wine to try. Loved picking fresh vegetables, herbs and strawberries directly from the site. Blessed with good weather also! Les Hirondelles is extremely comfortable and well appointed. The outside terrace provides a lovely Al fresco dining area as well as welcome shade from the Charente Maritime sunshine that is usually in abundance. The pool & garden areas are immaculately clean and well kept and regularly tubs of freshly picked vegetables and strawberries from the owners garden, appear by your door. The owners Moira & Bryan, are on hand to offer help and advice about sightseeing etc. and go out of their way to ensure your holiday is perfect. Nothing is too much trouble for them. You can wander through the vineyards or fields of sunflowers and bikes are available to cycle to the nearby port of Mortagne-Sur-Gironde or further if the mood takes you. My family and I have enjoyed staying at Les Rimaudieres since 2005. The surrounding countryside and coast are wonderful, as is the regional food and wine but year after year we return because of the superb accommodation and warm welcome we always receive from Moira & Bryan. Nearby Royan and St Georges de Didonne are 20 mins by car and offer a variety of sports: sailing, wind surfing and cycling. Tennis can be played locally. Birdwatching is good on the estuary. They have built wooden platforms to encourage the storks to nest. The golden sandy beaches of Meschersand St George de Didonne are just 15 mins away. For the children there are a variety of safe sandy beaches. The beaches along the coast from Royan to La Palmyre are for those who love surfing. Les Rimaudieres is in the department of Charente Maritime on the South West coast of France. This area enjoys the second highest hours of sunshine in France. The hamlet is just 15 mins from the A10 Paris- Bordeaux autoroute which makes it easy for travelling from the North of France or travelling from Bordeaux. The airports of La Rochelle and Bordeaux are literally 2 mins from the motorway ensuring an unstressful fly drive to this holiday location. Les Rimaudieres is situated in a pretty and tranquil hamlet, set amidst vineyards and field of sunflowers. Our prestige cottages are within 2km from the town of Mortagne where there are 2 bread shops, butchers and a Coop supermarket. The marina at the port has 5 restaurants. There are lots of good restaurants to choose from many specialising in seafood. Eating out is one of the great pleasures of this area. Local markets where you can buy the local fresh products are a must to visit. Visit the market in the morning and put on the BBQ in the evening. At Mortagne sur Gironde port you can eat overlooking the marina, watching the world go by sipping your favourite drink. Whatever your holiday preference this beautiful area of France has something for everyone. The Roman town of Saintes is 20 mins away. The medieval town of Pons 15 mins, and the picturesque village of Talmont with its 950 years old romanesque church overlooking the Gironde, is only 10 mins away. Just across the estuary you can visit the world famous vineyards of Chateau Margot, Chateau lafitte and many others. Cognac, La Rochelle, Bordeaux, St Emillion are all within 1 hours drive. If you are looking for a mixture of sightseeing, activity and beach relaxation, then the Charente Maritime could be your choice. Booking Notes: Security deposit of £100.00 per week. Arrivals after 4.00pm Departures no later than 10.00am. You can also pay by PayPal with your credit card. Changeover Day: Changeover day Saturday. Notes on prices: Prices are for the property per week in UK Pounds.